A Brow Lift was performed to eliminate this patient's chronic tired look. The brow lift, sometimes referred to as a forehead lift, is a surgical procedure designed to elevate the brow to a more youthful position relative to the eyelids. Since most people focus on the area of the eyes when talking to you, it can, by itself, make your whole face appear younger. Since the advent of newer minimally invasive techniques used for lifting the brow, the brow lift has become much more common in young, as well as older, patients. What problems does a Brow Lift address? My upper eyes droop and look tired all the time. Notice the list above includes several eye-related symptoms. I consider the Brow Lift to be an alternative for upper eyelid surgery, as it can lift the upper eyelids, often in a superior way, to a more youthful position. If you think you have excess skin in the upper eyelid, put your index finger above the mid portion of your eyebrow, and your thumb at the lateral (outside) part of your eyebrow. Lift to position the brow where you would like it to be. You will notice there is really very little excess skin. If you only remove 'extra' eyelid skin, the brow will still be in a low position that makes the eye area look small and crowded, rather than open and fresh. A brow lift, on the other hand, will make the eye complex appear more open and 'fresh.' A person with very severe 'hooding' of the upper eyelid will benefit from both brow lift and eyelid skin resection, or blepharoplasty. In contrast, a minimally invasive brow lift works by weakening the muscles that work to pull down or crease together the brows. The muscles that elevate the brow remain fully active. 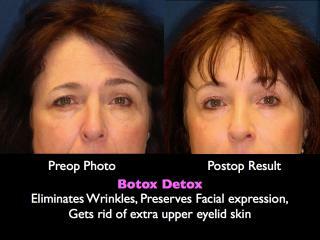 As a result, the brow is elevated, the 'worry lines' and forehead wrinkles are vastly improved. Treating the gradual drop in the brow, which causes excess skin over the eye, which starts putting a bit of weight on the eyelashes, actually works to also reduce the excess skin over the eye. Therefore, the brow lift addresses both problem areas and creates refreshed, natural looking results. In my surgery center, the brow lift procedure is performed under IV sedation administered only by a Board Certified Anesthesiologist. We prefer to use IV sedation instead of General Anesthesia to eliminate nearly all risks of pulmonary embolism . Recovery is much easier and quicker with IV anesthesia. The procedure takes 1-2 hours. In order to reach the muscles which need lifting, several small (about 1 inch) incisions are made in the scalp. An endoscope is introduced through one of the small incisions and the operating instrument through the other. The brow muscles are surgically altered. The skin is closed after fixing it in position. With the brow lift procedure, there is no long scar, no cutting of skin, no 'pulling back' on the forehead skin, and no hair loss. The basis of the procedure is altering the balance between brow depressors and brow elevators. This has the effect of lifting the brow to it's youthful position. Will my forehead look frozen after the brow lift surgery? The result of the Brow Lift surgery is long lasting and the brow does not look 'frozen' as it can with Botox. After surgery, the brow will be able to express emotions and will look natural. The Brow Lift can be combined with other facelift procedures such as the mid facelift or fat transfer to the face. However, even by itself, the brow lift can give wonderful, natural results for a more youthful and rested look. I'm fond of the procedure and find myself recommending it more and more often for patients looking for facial rejuvenation. What is Brow Lift Post-Op recovery like? How much does a Brow Lift surgery cost? The total cost for brow lift surgery in 2019 averages $4500-$5200. Total cost includes the surgeon's fee, OR fee, board certified anesthesiolgist fee, and all post op office visits. Please call the office at 410-494-8100 to find out more information or to schedule your consultation. See our patient gallery of Brow Lift Before and After Photos, all performed by me here in our surgery center. Please note that all of these patients have given written consent to use their photos at our web site. We are very grateful for their participation in patient education! Your first step to having a brow lift is to schedule either an in-person consultation or a virtual consultation (most often via Skype or Facetime). We see many patients from out-of-town and are happy to accommodate you whether you live in and around the Baltimore/DC area or are coming from across the country (or the world). We are only 30 miles from the BWI airport and 20 minutes from the downtown Amtrak train station. Want to speak to Dr. Rodriguez in person? Just give us a call at +1-410-494-8100 or Contact Us online to set up a consult. For patients who just cannot make it to the office for an in-person consultation, we also offer virtual consults for a $75 fee (which would be applied towards your surgery). We're happy to schedule a time for you to visit with Dr. Rodriguez virtually to discuss whether a brow lift is right for you and what your options are.